The concrete mixing plant control systems by haomei Industrial Equipment Company specialized produced has some feature: first-class technology, stable quality, perfect service, and is your best choice! Successful application of the hundreds of customers in the foreign, haomei Industrial Equipment Company based on years of experience and accumulation, continuous improvement and enhancement, provides more satisfied quality and service for users! Nowadays, one centre of concrete mixing plant is concrete mixing plant control system. Control system is very important as if human brain. Many users are unclear to features and functions of concrete mixing plant control system. Today, we introduce detailed concrete mixing plant for users. The main function of control system is centralized controlling whole concrete mixing plant, to insure everything well of concrete mixing plant. The control system main includes MCC control cabinet, operating floor, PLC and IPC system. 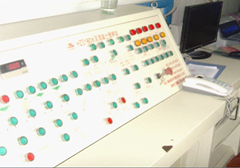 The MCC control cabinet includes low-voltage apparatus and frequency changer and other equipment. The operating floor includes operation button, intermediate relay and instrumentation. 1. The control system has these functions: showing flow rate and cumulant of materials, failure warning information and parameter modification. 3. The control system has some functions: long data storage time, the statistics and print of daily data, monthly data, yearly data. 4. Automatic burdening, continuous mixing, manual operation, ect, all control. For convenient maintain, the control system also has manual control changing-over function.